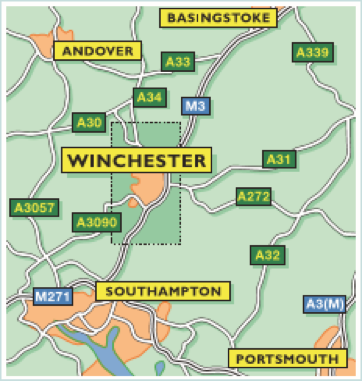 Winchester, and the workshop venue, are accessible by train and car. Information about flights is also provided below. 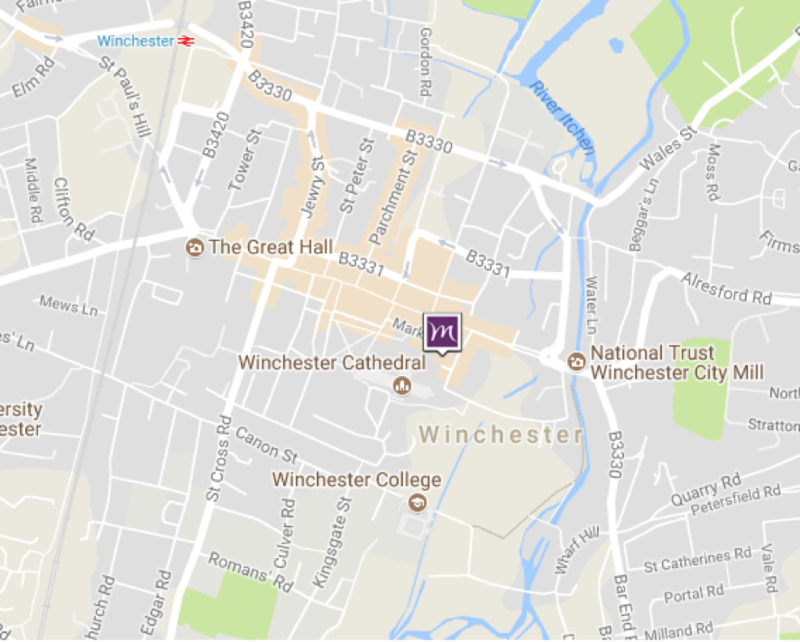 Winchester railway station is approximately 15 minutes walk from the workshop venue. Alternatively there is a taxi rank outside the station. There are direct trains to Winchester from London Waterloo (fastest train 54 mins), Reading (33 mins), Southampton Airport Parkway (9 mins) and Woking (34 mins). Winchester is well-served by A-roads and motorways. However, traffic is very heavy in rush hour, and, for example, after 8am it can take more than an hour to get from the M3 to the centre of Winchester by car. Parking in Winchester can be challenging. If you are staying overnight in Winchester, please ask your accommodation provider as to whether they have parking facilities. Reliable all-day parking is available via the Winchester Park and Ride scheme: There are four car parks near the City under this scheme, so please do check to identify which is most convenient for you. The nearest bus stops to the Workshop venue are on the Broadway. There is limited on-street car parking, but this is expensive and most of this is restricted to 2 hours of parking. All these parking options are explained, and maps provided, at http://www.winchester.gov.uk/parking/council-car-parks/. From London Heathrow Airport (approx 55 miles): There are no direct train services from Heathrow. Trains and metros run from Heathrow to central London and there are trains from London Waterloo to Winchester. Please see above for details of travel by train. There is a direct coach service from Heathrow to Winchester operated by National Express – http://www.nationalexpress.com. From London Gatwick Airport (approx 70 miles): Trains run from Gatwick Airport to Clapham Junction and from there to Winchester. Please see above for details of travel by train. Alternatively you can pre-book a private car transfer with English Rose Collection – http://www.englishrosecollection.co.uk or telephone +44 (0) 845 094 5646. From Southampton Airport (approx 10 miles): Trains run up to 4 times per hour from Southampton Airport Parkway (which is next to the airport) to Winchester and the journey takes only 9 minutes. Please see above for details of travel by train. The Workshop venue, the Mercure Winchester Wessex Hotel still has room availability. Sadly, there is no University accommodation available, because of the proximity of the start of term. The best place to find other accommodation from local hotels and B&Bs is http://www.visitwinchester.co.uk/where-to-stay. There is a pre-workshop informal meet-up for drinks on September 14th at 8pm at the Black Bottle wine bar (4 Bridge Street, Winchester SO23 9BH). People may wish to go on from this for some food. If you cannot find us, please contact Caroline Wilson on +44(0)7554889350. The location of the conference dinner will be confirmed closer to the time, as the location is dependent on the number of attendees. Please note that the Workshop dinner is self-funded. History, art and military heritage are the main focus of activities in Winchester. For those planning to stay in Winchester a little longer, the Cathedral is close to the workshop venue and is very interesting (although they do charge for entrance!). Two easily-accessed (and free) attractions that can been seen quickly are the Great Hall of Winchester castle and medieval garden, with its medieval fake of King Arthur’s Round Table, and, a J.M.W. Turner exhibit at the Winchester Discovery Centre Gallery. More details about what is on in Winchester can be found at http://www.visitwinchester.co.uk/things-to-do.